A sloth is a slow-moving, tree-dwelling tropical American animal. They have long, coarse, brown or grayish fur and big claws for gripping tree branches while hanging upside down, as they usually do. And do you know why they’re called that? Because sloth means ‘laziness’ or ‘unwillingness to work,’ which is what the slowness of these animals seems to suggest. Several sloths hung from the trees. The teenager's sloth caused his parents to despair. The manager made it clear that she would no longer tolerate the employee's sloth. Sloth is one of the seven deadly sins. Sloth dates back to the mid- to late 12th century. The Middle English noun slowth, meaning indolence or sluggishness, was formed by adding the suffix -th to the adjective slowe or slou (meaning slow). It can be traced back to the Old English noun slǣwð (slǣwth), which derived from the adjective slǣw, which meant ‘inactive, lazy, slow, sluggish or torpid’ as well as ‘not smart or clever.’ Some linguists argue that we should consider the Old English an older version of the same noun, placing the date for sloth to before the year 900, but due to a large number of changes, and the fact that the noun disappeared and was then re-formed the same way from the adjective, most prefer to use the later date. Slow (and therefore sloth) can be traced back to the Proto-Germanic slæwaz, though its origin before then is unknown. It is related to the Old Saxon sleu (blunt or dull), the Middle Dutch slee and the Dutch sleeuw (sour, tart or blunt), the Old High German sleo (blunt or dull), and the Old Norse sljor, the Danish sløv and the Swedish slö (all meaning ‘blunt or dull’). 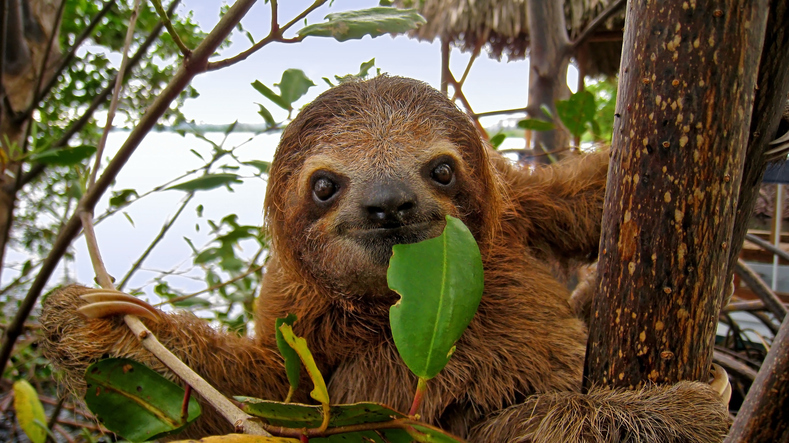 The sense ‘slowness or tardiness’ appeared in the mid-14th century, but the animal was not named a sloth until the early 17th century; it is a translation of the Portuguese name for the mammal, preguiça (slowness or slothfulness).